It's time for this post. It's been time for a long time. 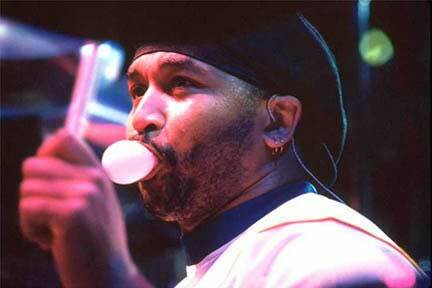 Carter Beauford of the Dave Matthews Band is one of the reasons I play drums. I started playing drums in the sixth grade in the middle school band. By the seventh grade, I had a drum set in the basement and was jamming with a friend (a once-in-a-lifetime guitar talent, it turns out). By the ninth grade, everything I heard on the radio just made me mad. I'd constantly think to myself - or complain aloud to anyone who would listen - "I can do anything any of these guys do! Why am I not famous and making loads of cash as a drummer?" (Reason number one is probably that I was fifteen years old, but I wasn't really thinking of that.) Anyway, long story short is that I wasn't hearing anything that I thought was creative or sophisticated, and I was pretty frustrated with what I thought was the height of modern pop-rock drumming. The summer after my junior year I had to borrow a car from my boss (cool boss, no?) to run an errand. Her car was a late model Acura with a killer sound system, and the disc that was playing was the aforementioned "Under the Table" album. I had heard of DMB but never actually listened to them, so I didn't even know who I was listening to. When I got back I was actually a little disappointed when I found out (skeptical kid! ), but it was too late. I was hooked. I had never heard a drummer do things like Carter did/does with the backbeat, fills, set-ups and pulse*. It was like going from black and white to color. Fast forward about six years and I owned everything then available from DMB and played in a band that had a fiddle player. And since then I've done more studying and listening and loved every minute of it. Carter B is the man, and his playing has only gotten better and more musical. After you've had a chance to just get immersed in the music, it's worth checking out Carter's instructional video, "Under the Table and Drumming." There's not a ton of nuts and bolts instruction, but a lot of, "This is what I was doing on this part," and a few great conceptual things. There are a million videos I could choose from to give you a sample of Carter's playing, but I've always believed that's all about the music - the song as a whole - and that the drummer has to contribute to that. So this track is my all-time favorite DMB tune, and one of Carter's grooviest and most musical performances. One caveat: this video conforms to the radio edit of this track. Do yourself the favor of tracking down the album version and giving it a thorough listen. It's almost double in length to this version. No offense to Dave, but the best music happens after the singing stops. See if you can count the number of instruments being used during this track. Alright, enough talk (er...type). Let's get to the tune. *It doesn't hurt that Carter plays an unusually large and complex drum kit. You can check out his current configuration of gear here. Im looking to get a kit that has a similar sound to Carter, I have never owned a set although I have played a considerable amount with friends etc. What is the best route to get a similar setup for under $800? Luke, there are lots of places online where you can see exactly what Carter plays, so you can get an idea for the amount of gear involved. This will include the sizes, materials, configuration, etc. As far as getting a kit that is similar to Carter's, I'd ballpark his kit in the $20,000+ range if you include all the cymbals and extra "toys." If you're just looking to get the same basic setup, I'd try used first. You'll get more bang for your buck if you can find a good deal. Another route is to start small and add/upgrade pieces as you get more money. Maybe start with a great five or six piece kit in the same sizes as some of Carter's gear. Either way, I'd do some serious homework first, and keep playing as many kits as you can - both friends' and drum shops, etc. Best of luck, and thanks for stopping by!